In this world there are mysterious machines called "Tremble." No one knows where they came and why they were built. The only thing known is that they continue to evolve and attack humans. The only way to defend yourself is to try to destroy them, but there are those who have learned to control certain and use them to your advantage ... the Breeder. These extraordinary individuals, however, have a difficult life, always on the run from people who fear them and treats them as criminals. But Ion is not one to be discouraged, so he decided to follow his father's footsteps and become a Breeder, a tamer of Tremble! Awwwww shiiiiit dawg. Its time for Bullet Armors. Bullet Armors is a relatively short battle manga. You could read this in 2 hours, so it's not a huge commitment to pick it up. This a VERY light read with no complicated plot points or motivations. The story is obviously aimed at younger readers (not quite as insultingly low as, say, Cage of Eden, but still pretty low), maybe 11-14. The art style is similar to that of Fairy Tale, but a bit sharper with a more masculine feel. The tech in the series, namely the "tremors"/"tremble," is picked out in delicious greebly detail that got me MEGA HYPE every time a battle broke out. I was mildly disappointed with the missed opportunities with this manga; it ended far too soon. And when the only fault you have with a series is that it ended, you may as well count that as a compliment. 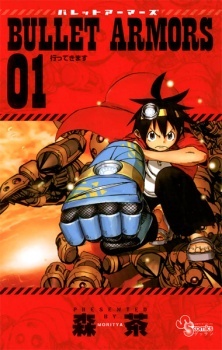 I cannot repeat enough that you should go into this expecting a very normal shounen battle manga aimed at children, having only one or two levels of complexity over things like Mazinger. Overall, I give this series a single thumb up. It was aight. This manga is not completed at all. The story has been only half developed (if not less) and many important passages have been skipped. Due to this incompleteness, the story lacks of any deeper meaning. It is like a manga for 10 years old kids who would not care about a proper development and ending. The only decent thing is the art work. It is a shame that the mangaka, after starting with quite a good idea, then has not been able to carry it on properly. I suggest you to not not waste your time with it because the delusion at the end is quite big in finding that there will be no sequel.